After last week’s relatively joke-light, blisteringly over-plotted episode, I was worried that B99 was going to keep up that grueling pace for the entirety of this closing three-episode finale arc. But “Maximum Security” is a great installment of the show, keeping up some meaty plot mechanics without sacrificing the quirky, referential humor that makes it such a joy to watch. As Holt reminds us in a bit of opening exposition, Adrian Pimento is still on the run, having faked his own death and deserted his engagement to Rosa after the Mob boss he worked for while undercover put a hit on him. Unfortunately, since Jimmy “The Butcher” Figgis has an FBI agent on the take, the precinct can’t just arrest him—and they also have no clue who the double agent might be, aside from the prominent scar that Jake saw on his hand. So they decide to take a two-pronged approach: embedding a member of the squad in women’s prison, where they hope she can cozy up to Figgis’s sister and learn more about his operation, and throwing a fake funeral for Pimento, in the hopes that the double agent will show up. Neither of these strategies pack a whole lot of logic as investigative tactics (I’m not sure how a woman who’s been in prison in Texas for years would have up-to-the-minute intel on her brother’s illicit activities, or why someone who put a hit out on a cop would attend his funeral), but they both work pretty well as comic premises. The prison operation is centered around a somewhat obvious but still enjoyable plot line: Even though Rosa is the most logical candidate for an undercover stint in a women’s prison (Holt: “She’s terrifying.” Rosa: “Thank you, sir.”), she’s already a known quantity to Maura Figgis. So it’s up to nerdy Amy to convincingly simulate a penitentiary-hopping badass. Unfortunately, while Amy takes to prison intimidation surprisingly well, contesting Maura for control of the prison’s contraband operation, Jake is the one who’s getting cold feet—he’s terrified Amy will get hurt, and keeps yanking her out of situations where she’s about to step to Maura, reminding her that prison isn’t High School Musical. (Or High School Musical 2. Or High School Musical 3: Senior Year.) His fear for her ends up being a nice way for the show to play into their romantic relationship, which has been as back-burnered for most of the season as their will-they-or-won’t-they arc was. In a particularly sweet scene, both of them admit to being more freaked-out than they thought they’d be about dating a fellow cop, each worrying that the other might be in real danger. 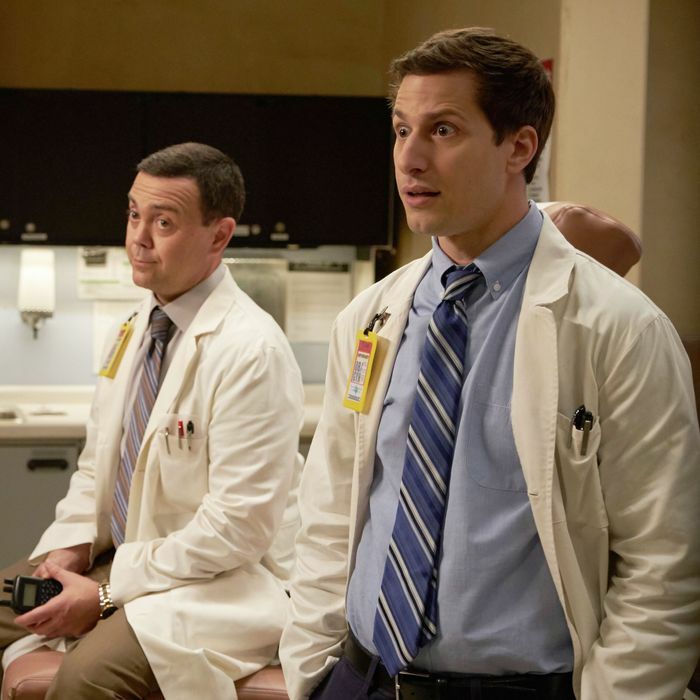 Of course, this is Brooklyn Nine-Nine, so the conversation is had with hopeless romantic Charles in the background, getting increasingly frustrated as to why they won’t go to comfort each other. Needless to say, he’s over the moon about the pair’s nonexistent baby. It was nice to see Aida Turturro (a.k.a. Janice from The Sopranos) as Maura — she’s awesome and I don’t think she gets a lot of roles these days. She’ll be back next week, too.